We’ve all heard of weightlifting, bodybuilding and Crossfit. In the past decade, intensive athletic programs such as these have experienced a surge of interest from men and women looking to test the limits of their physical and mental strength. 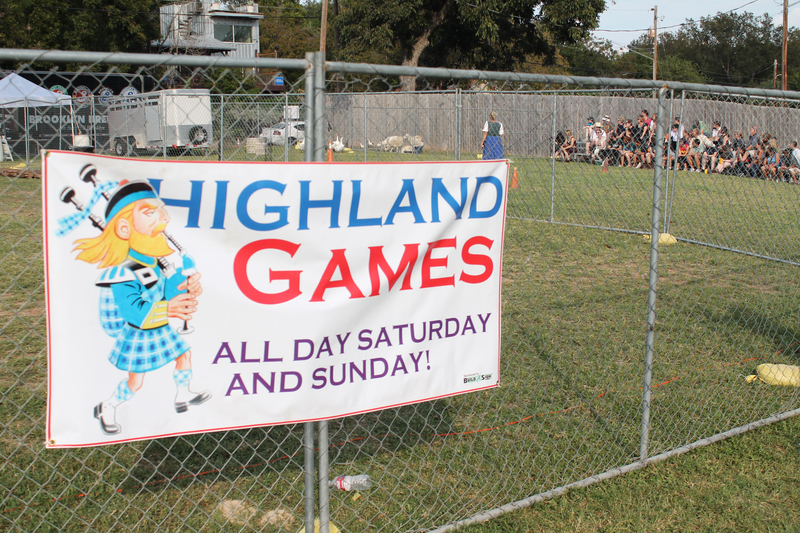 But how often do you hear of the Highland Games? Mike Baab participates in the caber toss at the Austin Celtic Festival on Oct 19. In 2005, Baab won the Masters World Championship in the 45-49 age class. Traditionally, Highland Games are events held throughout the year in Scotland and other countries to celebrate Scottish heritage and culture, particularly that of the Scottish Highlands. 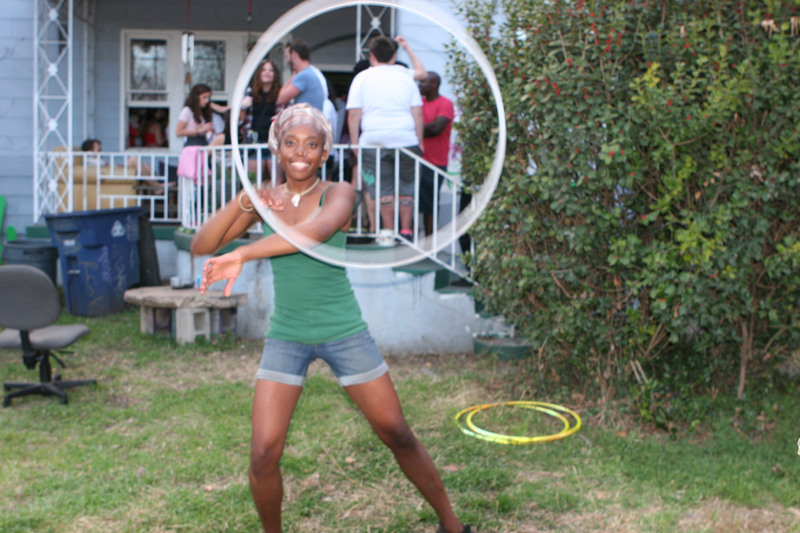 While other activities are often part of the festivities, the heavy sporting events are the most emblematic. 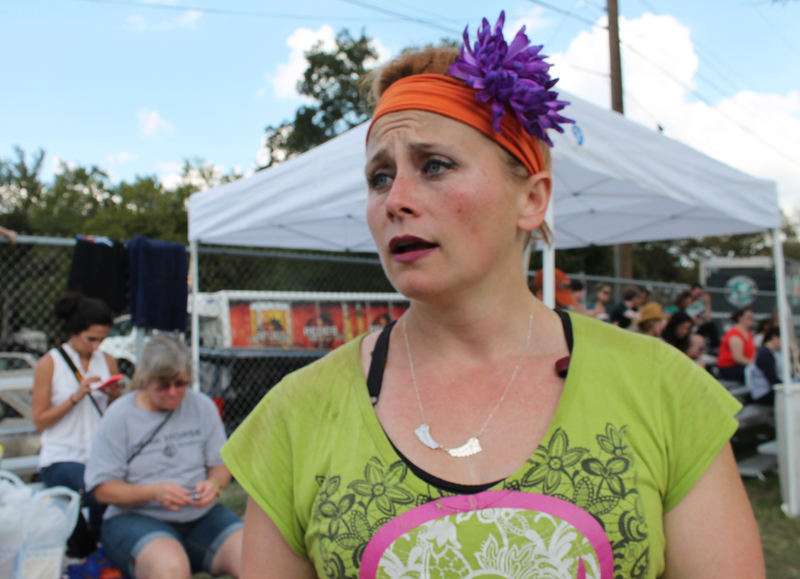 At the annual Austin Celtic Festival, held on Oct. 18-19 this year, a swelling crowd gathered around the heavy athletics competition to watch male and female athletes grunt and shout in frustration and exhalation as they attempted to best each other and their own personal best records. 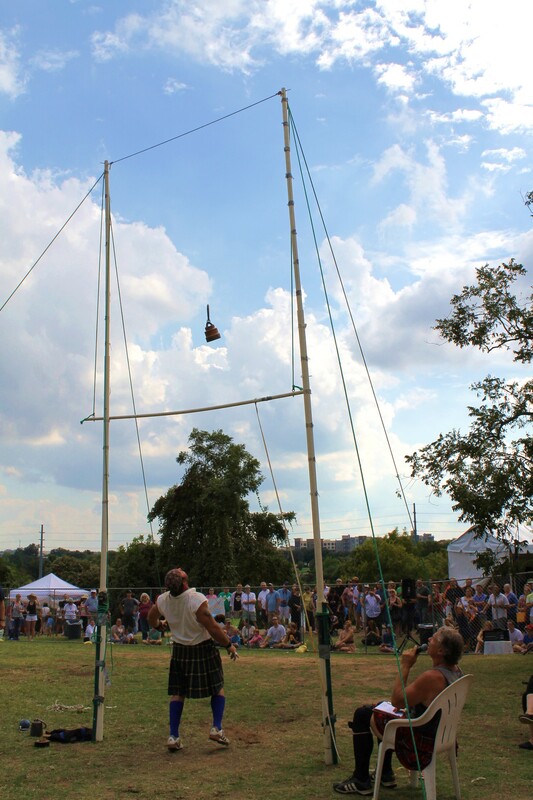 Although Highland Games can consist of a variety of different heavy sporting events, this particular festival featured the caber toss and the weight over the bar. 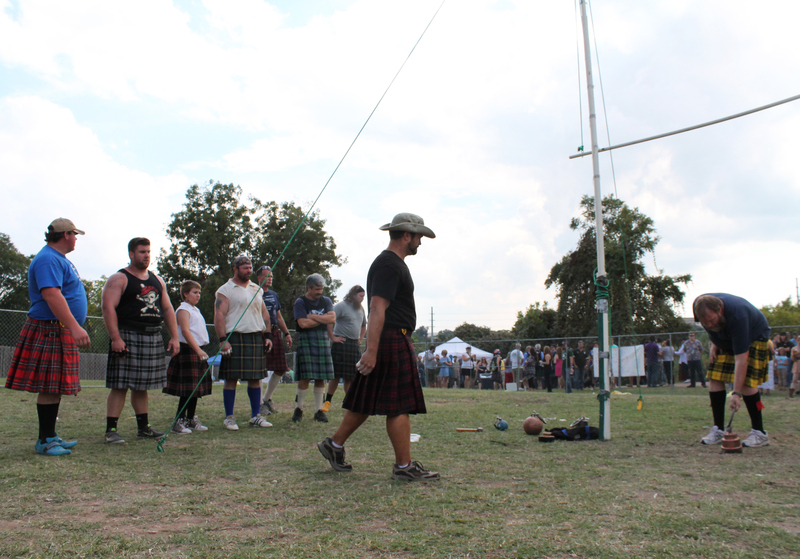 The Texas Celtic Athletic Association (TCAA) is demonstrative of the reach of the Highland Games, as they have made their way from Scotland to the Lone Star State. 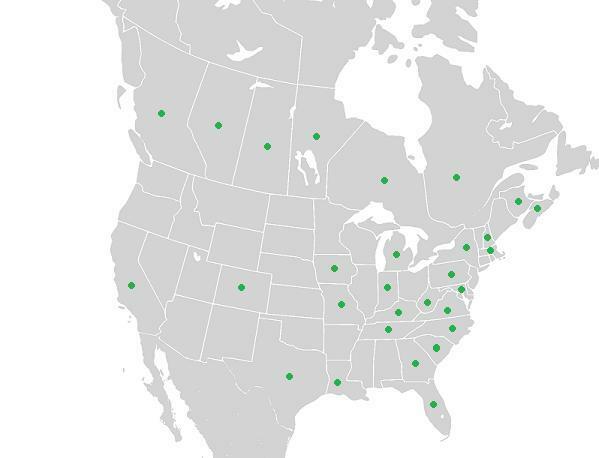 States and provinces in North America hosting Highland Games competitions. 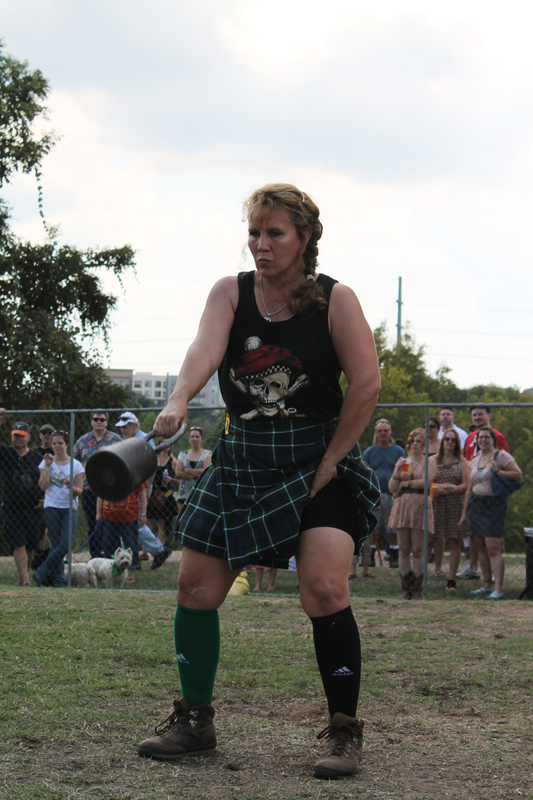 After seeing Highland Games at a Renaissance fair 11 years ago, Brittney Boswell became the first woman to officially compete in Texas. As the current Secretary of TCAA, Boswell said that many women at the time hadn’t yet realized competing was an option for them, as they had no examples to follow. 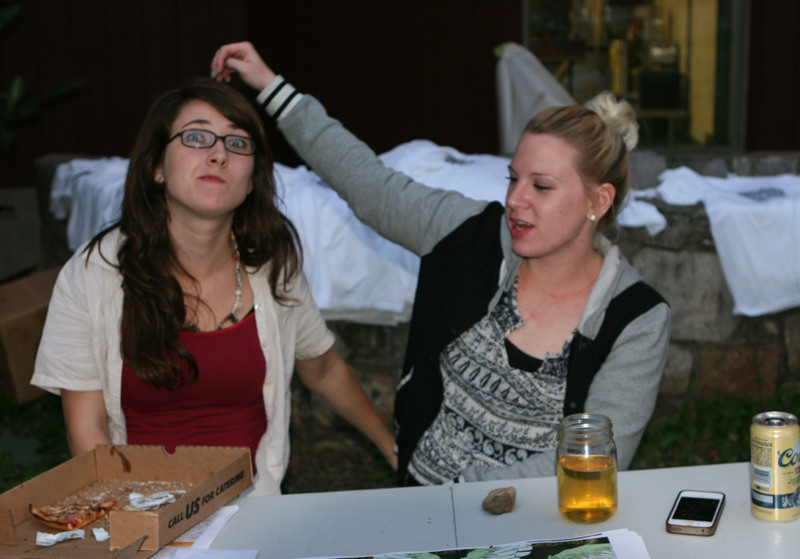 “Celtic societies and organization like (TCAA) are a big push for family involvement. When these guys come out and they bring their wives and girlfriends and daughters, it’s an opportunity for these girls to get a foot in the door,” Boswell said. Over the years, this type of foster system within the organization has opened up the opportunity to maintain regular women’s classes and a consistent stream of 10 to 18 female athletes throwing at any given event over the past several years. 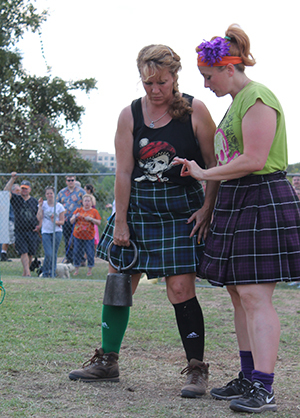 Brittney Boswell (right), the first woman to compete in Highland Games in Texas, offers advice to a fellow athlete before the weight over bar event. 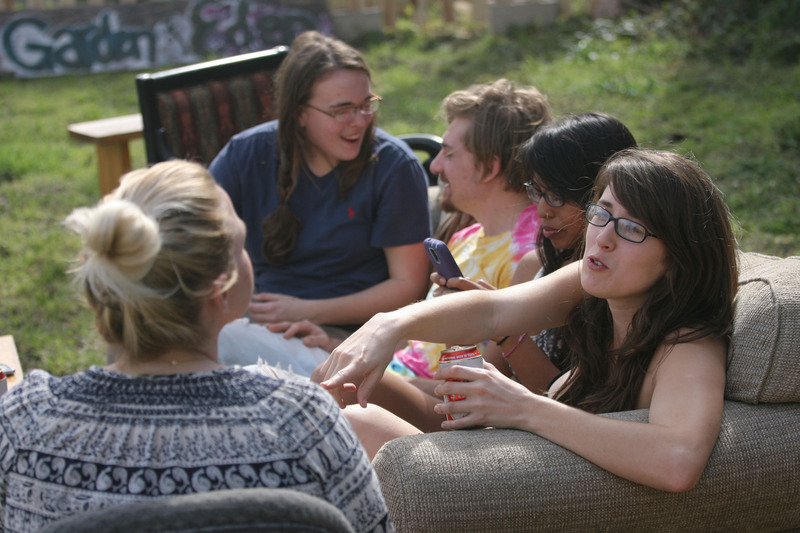 TCAA holds weekly practices in both North and Central Texas. Those looking to go the extra mile practice multiple times each week, in addition to spending plenty of time in the weight room to increase their strength. Some athletes, like TCAA’s founder and president Duncan McCallum, have garnered a long list of achievements and titles as amateurs. McCallum has competed in Norway, Canada and each American state with the excepting Hawaii and Alaska. Despite the competitive nature of the sport, the success of the organization depends on a tight-knit community and system of mentoring. 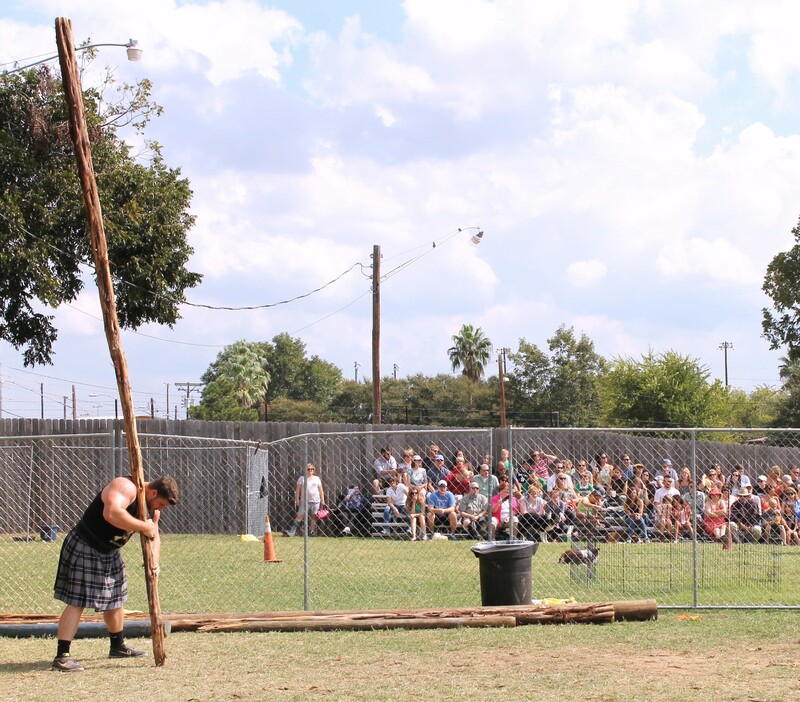 Five years ago, McCallum was trained by Athletic Director Mike Baab, a University of Texas at Austin alumnus and former professional football player who turned to Highland Games after an 11-year NFL career. It was Baab who, along with other veterans of the Highland Games events, initially encouraged Boswell to attend games and compete as the only woman in the field. A week before games, Baab generally runs a clinic so that those new to the sport can get their competitive jitters out of the way and begin to understand how to go about conquering each event. 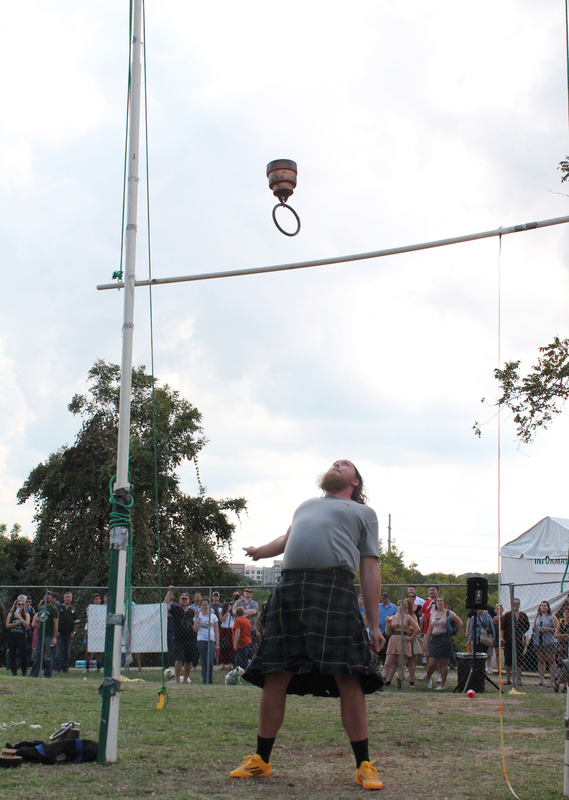 Additionally, events like the Austin Celtic Festival have an open-door policy when it comes to Highland Games so that anyone with the will can try their hand at competing. For the weight throw for height event, women must throw a 22 lb. weight over the bar. Starting at 11 feet, the bar goes up one foot for each successful throw that completely clears it. Photo by Larisa Manescu. Bagpipers are a common element at Highland Games events. 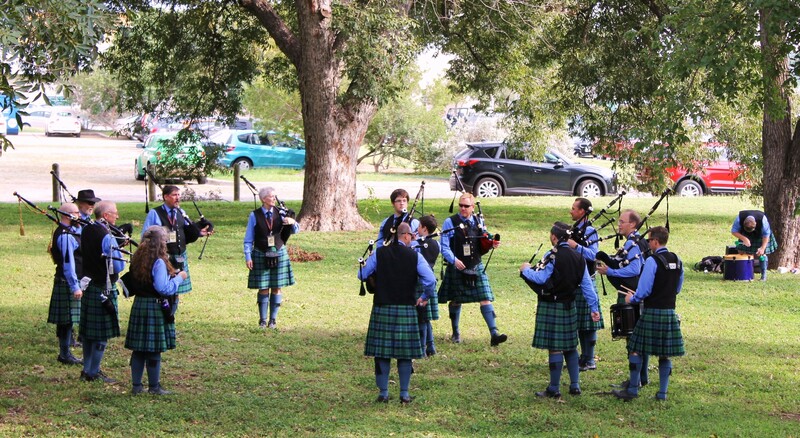 At the Austin Celtic Festival, the musicians played during the Celtic dog parade. 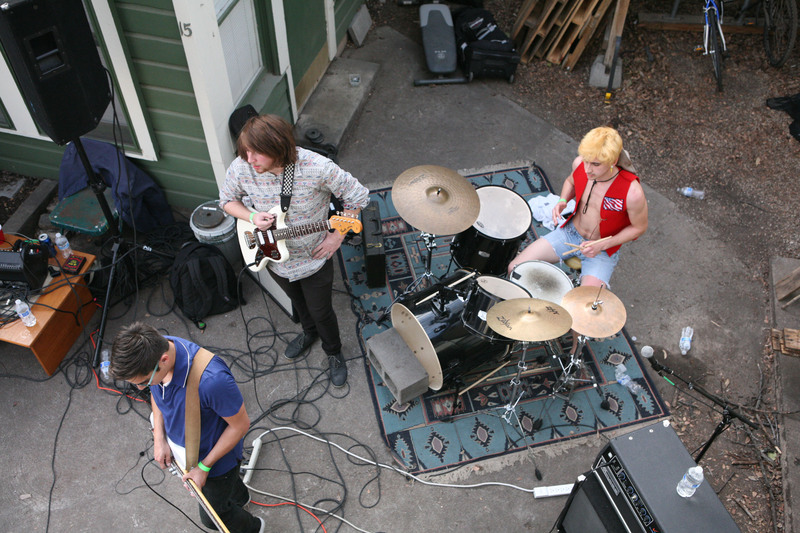 Photo by Jared Wynne. Males must throw a 56 lb. weight over the bar for the weight throw for height event, which starts the bar at 11 feet. The current world record is 19'2.00". Photo by Jared Wynne. 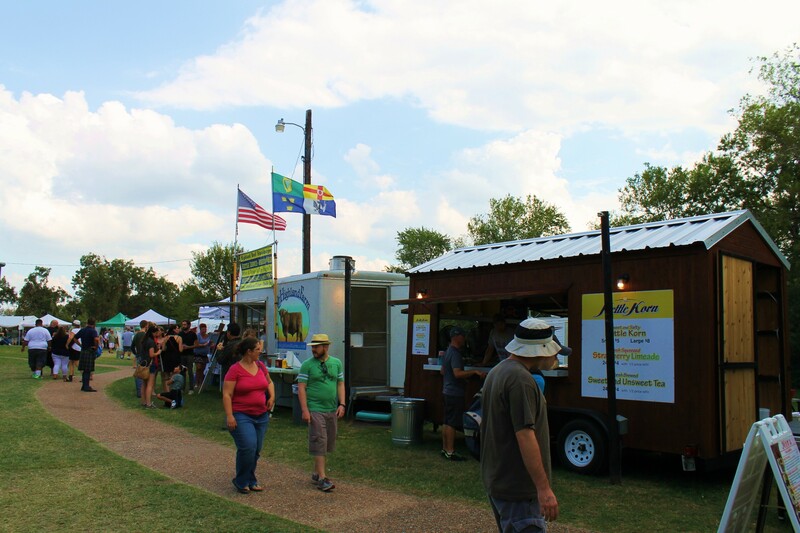 A variety of cuisine is on offer at the Austin Celtic Festival. Some of it is traditional Celtic fare, while other selections are simply local favorites. Photo by Jared Wynne. 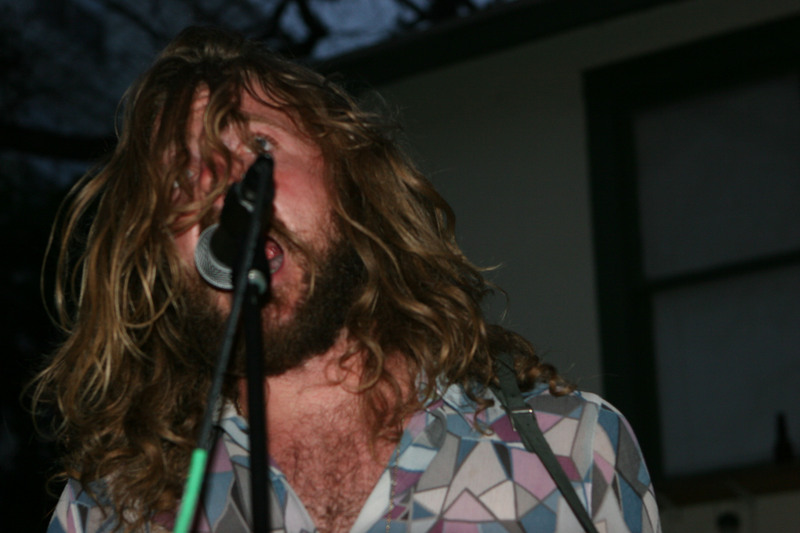 Live music is a staple at many Celtic festivals, including the one held in Austin. 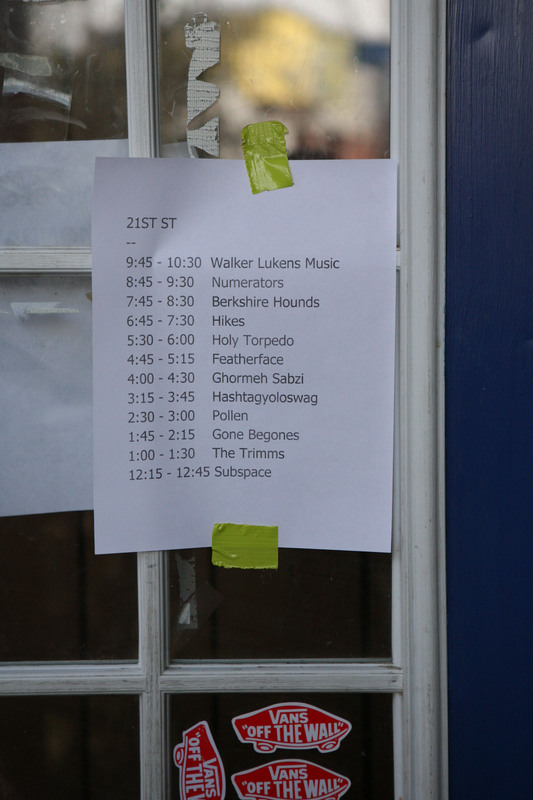 A full slate of acts keep the volume turned up throughout the day's events. Photo by Jared Wynne. Talented herding dogs are shown off to an adoring crowd. The dogs are made to manage both geese and sheep. Photo by Jared Wynne. 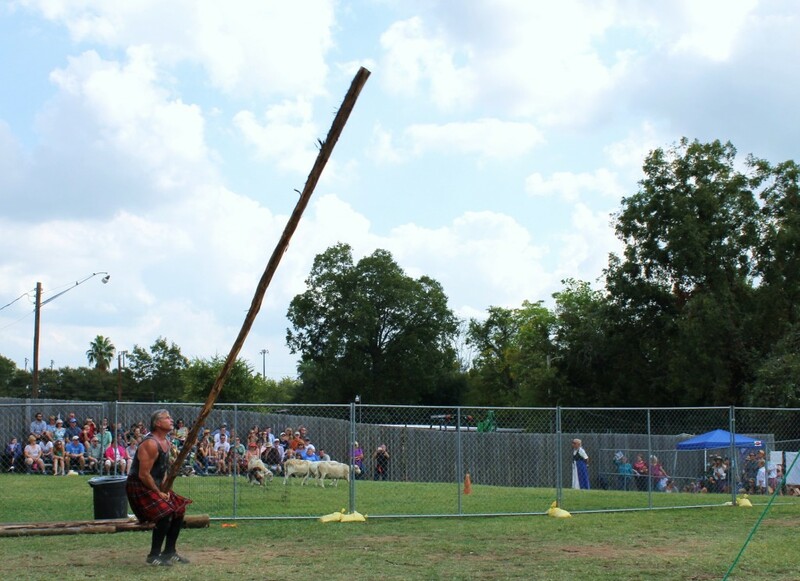 Competitors in the caber toss begin by balancing the big long against their shoulder in preparation for the big lift. Photo by Jared Wynne. 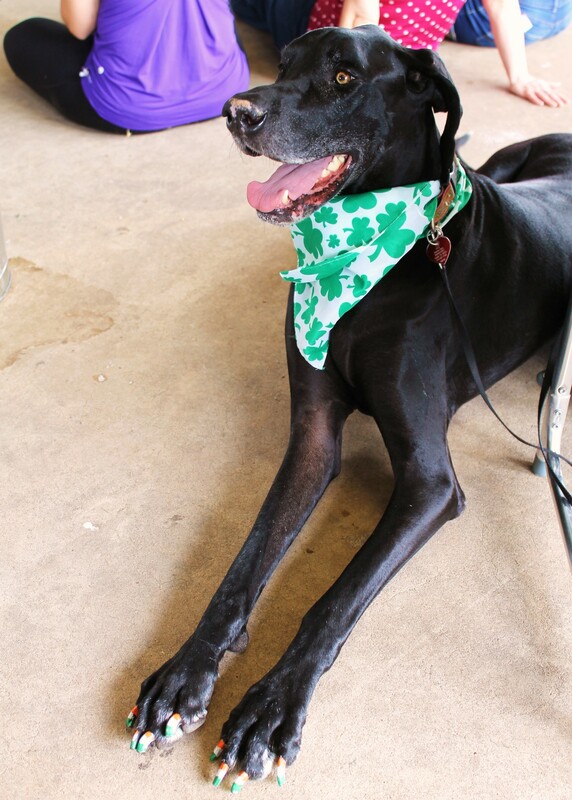 Dogs are a common site at the Austin Celtic Festival. Many will participate in the dog and pony parade. Photo by Jared Wynne. The entrance to the Highland Games area at the Austin Celtic Festival. Photo by Larisa Manescu. 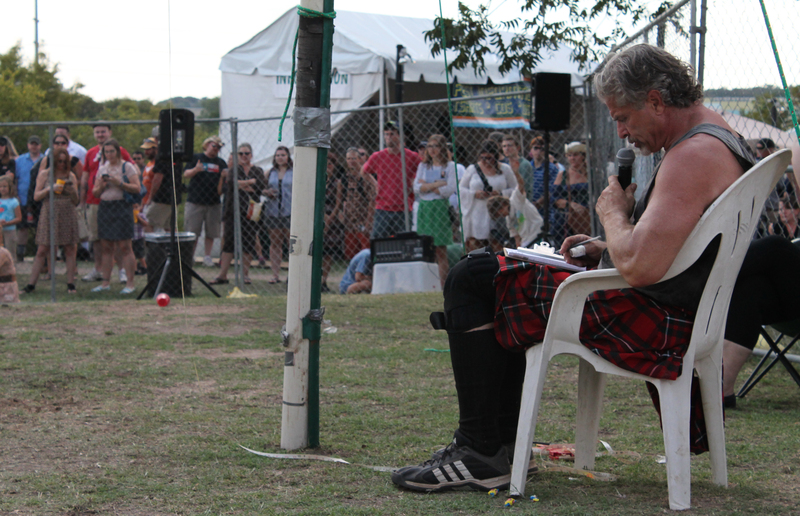 Mike Baab acts as both competitor and emcee at the Austin Celtic Festival's Highland Games. Photo by Larisa Manescu. 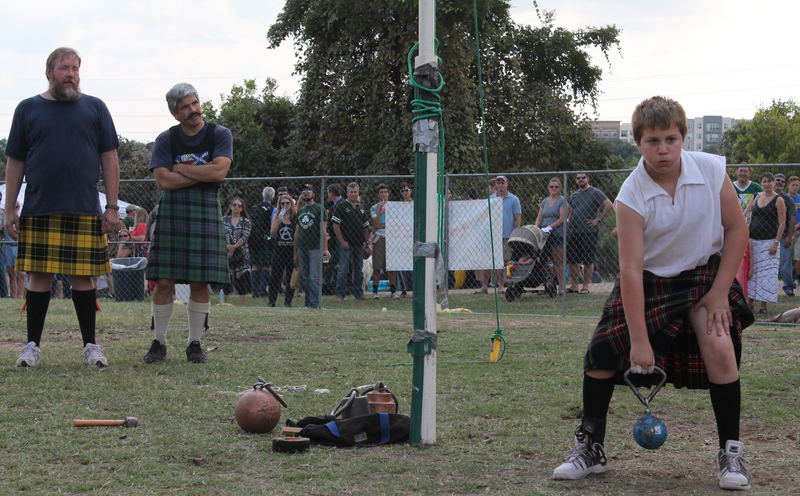 Participation in the Highland Games is often generational. Photo by Larisa Manescu. Competitors prepare to give it their all in the weight over bar event. Photo by Larisa Manescu. Falling weights are a constant hazard at the games, though few competitors show any concern. Photo by Larisa Manescu. Participants in the weight over bar event prepare for each throw by swinging the heavy weight back and forth, either at their side or between their legs. Photo by Larisa Manescu. Brittney Boswell cools off after taking part in the Highland Games competition. "Over the last ten years, you can certainly see that Strongman and Crossfit have certainly helped us garner more athletes for our funky, little fringe sport where we throw rocks and sticks for a good time," Boswell said. Photo by Breanna Luna. 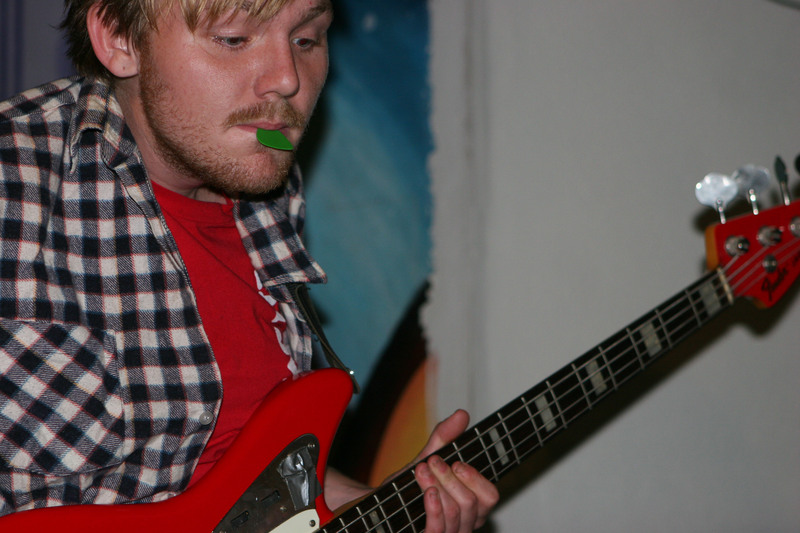 A web developer by trade, Mike Beech first discovered the games in 2011 while looking for new and different experiences. Drawn to the idea of doing charitable work in Texan communities while promoting the competitions he’d grown to love, he joined TCAA three years ago. As a member, he has helped to advance the organization’s web presence and promote the sport in the state of Texas and beyond. Beech is now the president and executive director of TCAA, no small feat for a father of two young boys. Beech said he’s always amazed at the commitment put into the organization by both the athletes and their supportive families. “I often find myself in awe of some of our athletes who persevere and succeed in Highland Games in spite of their demanding lives and schedules,” Beech said. Unlike Boswell, who discovered her love for the sport without any previous athletic experience, Beech was a baseball player in high school and a nationally-ranked fencer during and after college. He insists that he can’t overstate the value of community that TCAA brings to his life and the sense of reward he feels from doing charitable work with fellow members. The involvement of the Celtic community, like the support of local business Things Celtic, allows TCAA to grow. In turn, the organization puts on a good show, and the athletes, their families and the general public bring money to Celtic festivals and events. But while the sport provides entertainment for festival visitors, that doesn’t mean it doesn’t have a significant presence in the athletic arena. Some of the best athletes in the world get paid to travel and compete in Highland Games. 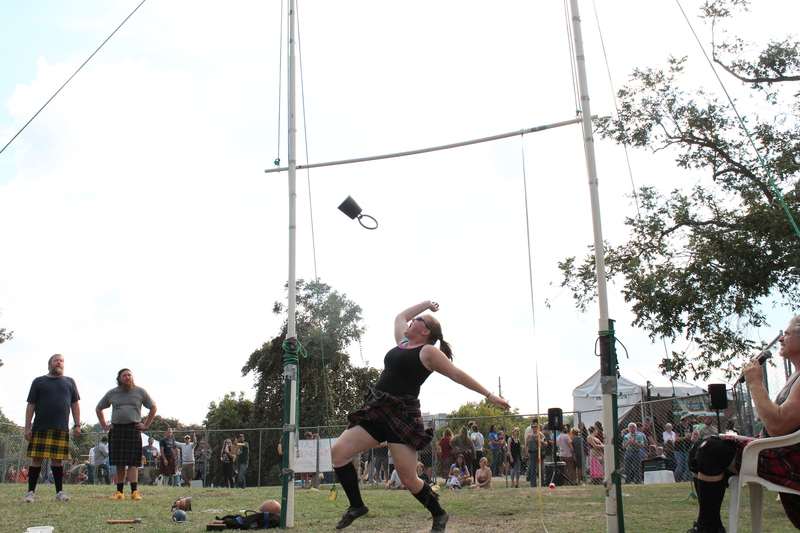 “I’m sure a lot of sports on the fringe feel this way, but I believe Highland Games is ready for the big stage. We have the athletic feats and personalities to entertain millions,” Beech said. 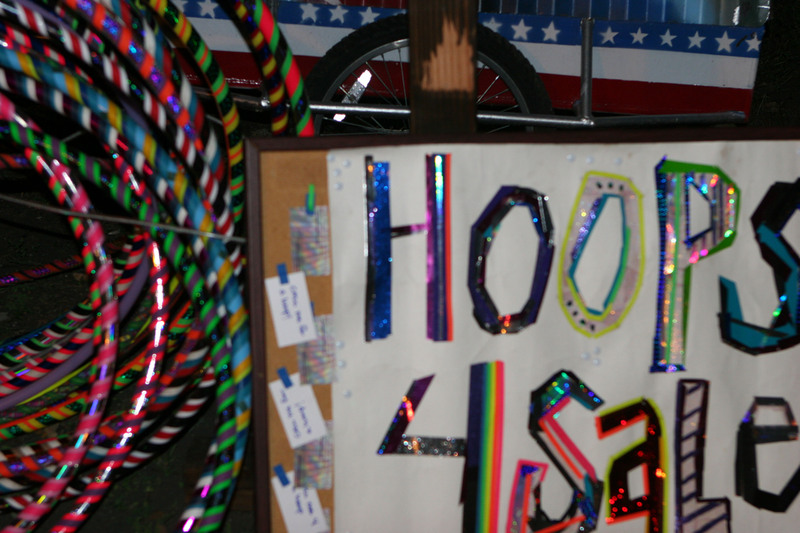 Higland Games at Austin Celtic Festival from Breanna on Vimeo. Song after song, Bill Holden exercises his polka and waltz skills with a new partner. He’s been dancing for 47 years, and here on the dance floor he’s in his element. 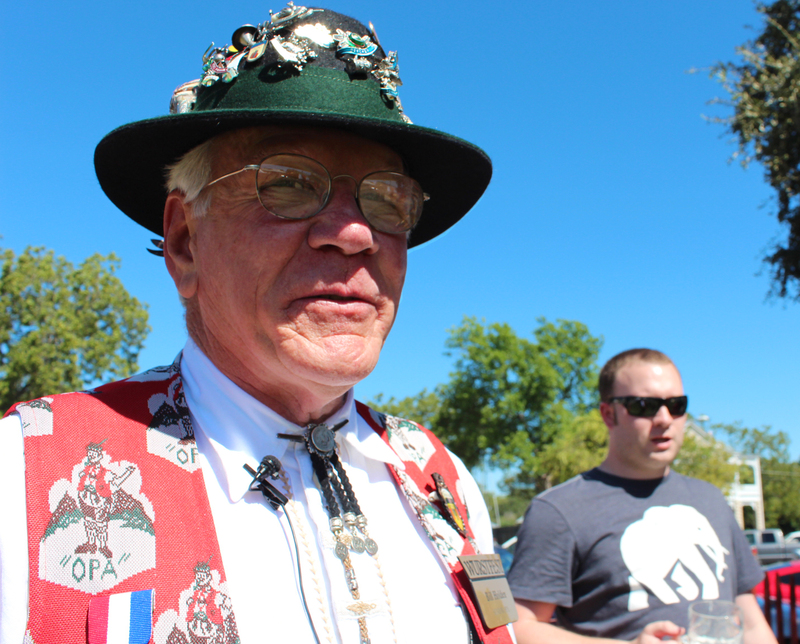 Holden wears a name tag identifying him as a Wurstfest Grosse Opa, a honorary title that the Wurstfest Association gave him last year for his loyalty, dedication and willingness to participate. Clad in a green Bavarian hat dotted with pins, a red vest and lederhosen, Holden may seem hard to miss. 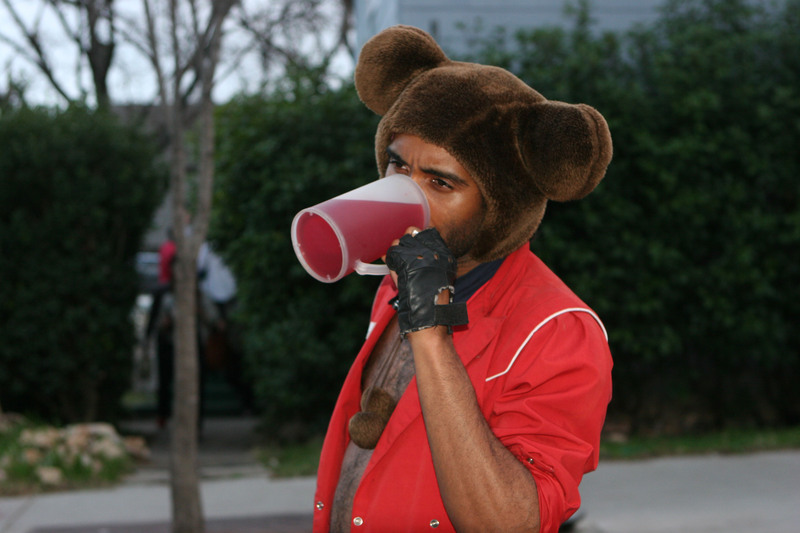 But his appearance is far from unique in the beer garden. 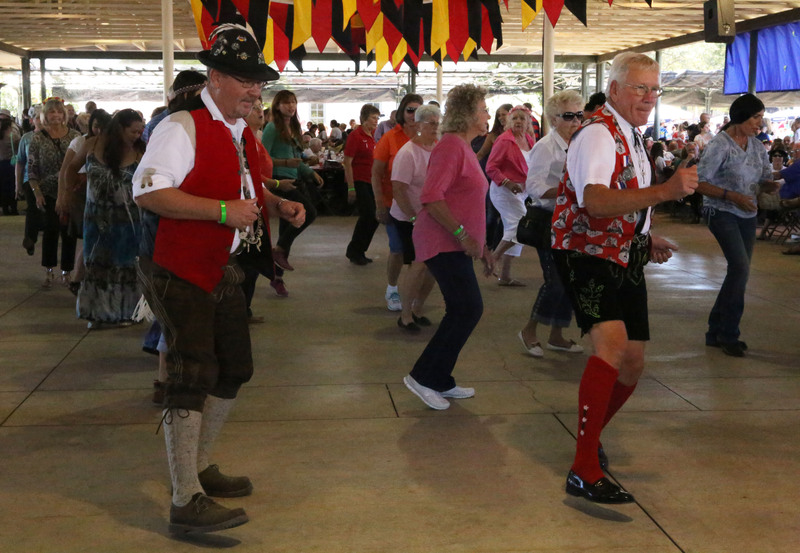 Dancers crowd the floor as live polka music fills the beer garden at the Oktoberfest Festival on Oct. 4 in Fredericksburg, Texas. 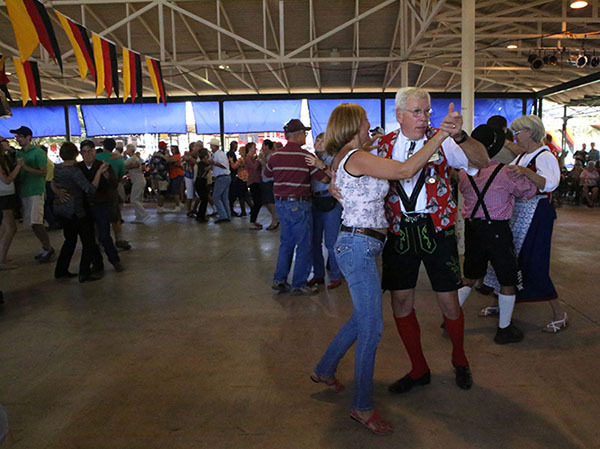 Wurstfest Association member Bill Holden first began dancing in the seventh grade, when his parents sent him to the Arthur Murray Dance Studio located in Austin, Texas. 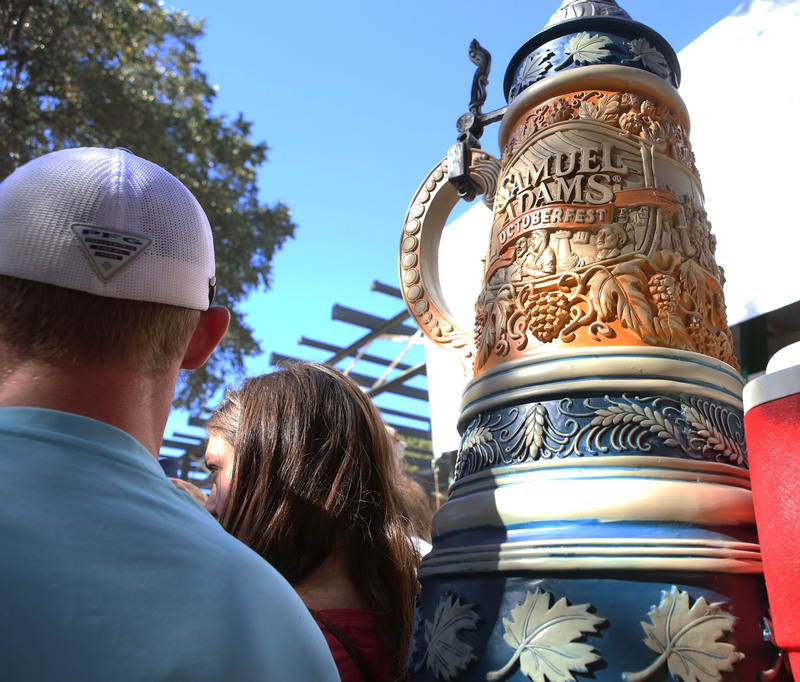 On October 3-5, the weekend of the Oktoberfest festival in Fredericksburg, Texas, over 20,000 people showed up for the 34th celebration of German-Texan heritage and culture. People of all ages donned traditional dirndls and lederhosen, and there was no shortage of beer waiting for them. 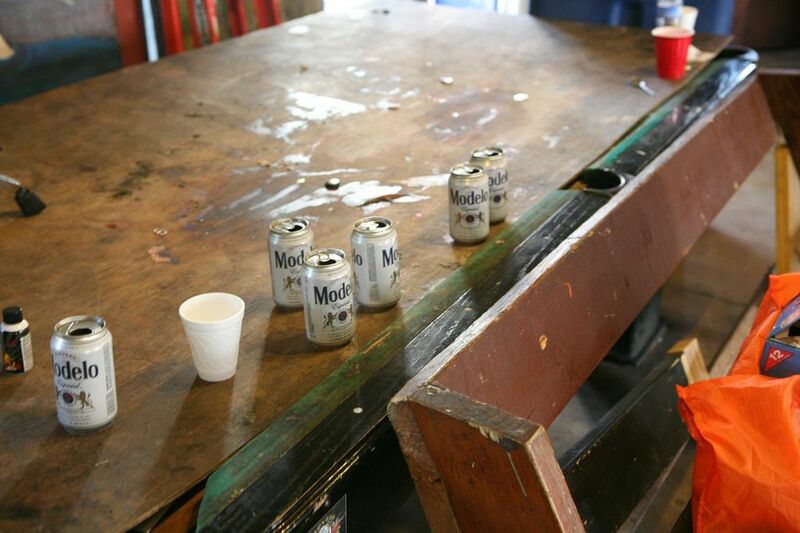 But the annual festival represents more than an opportunity for excessive drinking. 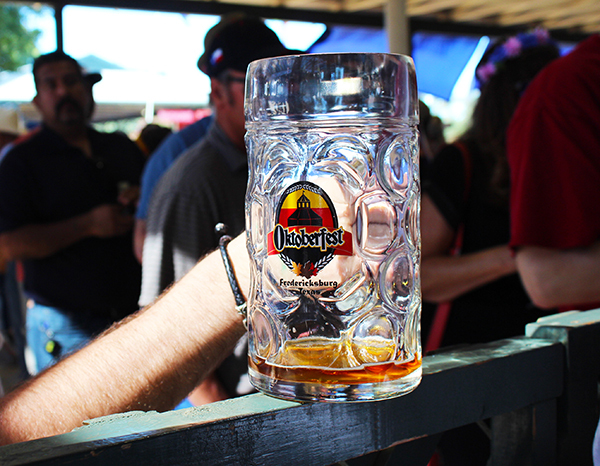 In addition to dancing to a variety of live bands at one of the three beer gardens, activities at Oktoberfest include stilt walking, indulging in traditional German dishes like bratwurst, potato pancakes and schnitzel, and participating in a stein-holding competition. There’s also a carnival area for the children, and various local artisans and food vendors put their products on display in tents. 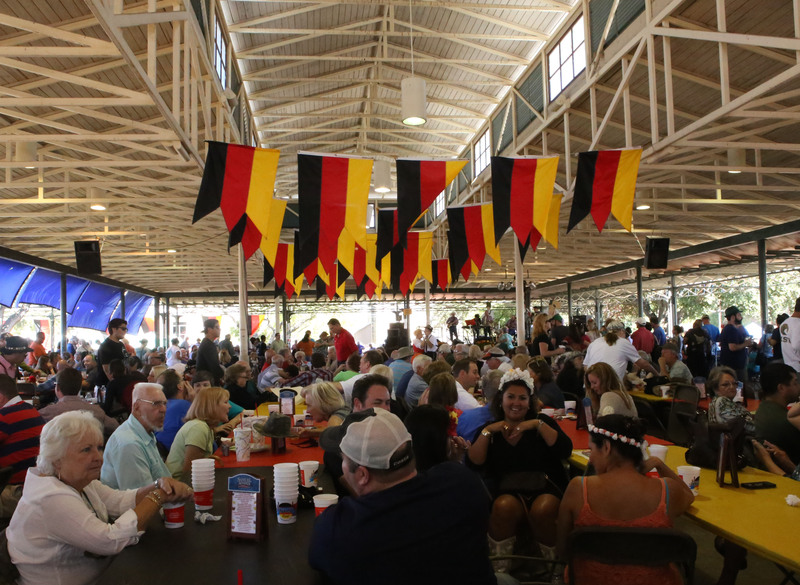 While some attendees may be curious first-time visitors to the festival, many have significant ties to the German heritage community in Texas. Festival attendee Gene Hackemack has been playing German and Czech music since the late 1970s. 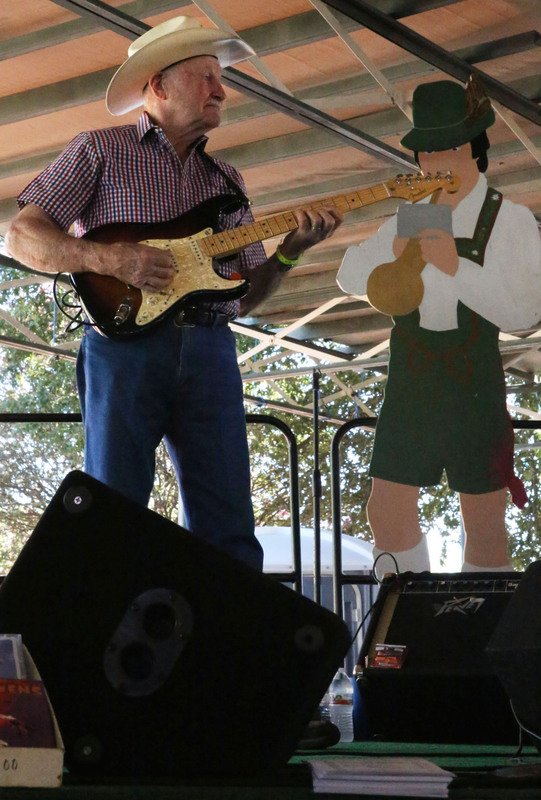 His business card is labeled “Gene Hackemack’s Oompah Musik” and states, “Have Squeezebox [Accordion] – Will Travel.” While plays at a variety of German and Czech festivals like Oktoberfest, and he has the right background for it. His great-great grandfather arrived in Galveston, Texas from Germany on June 4, 1854, and his family spoke Texas German, a dying dialect, until the 1960s. 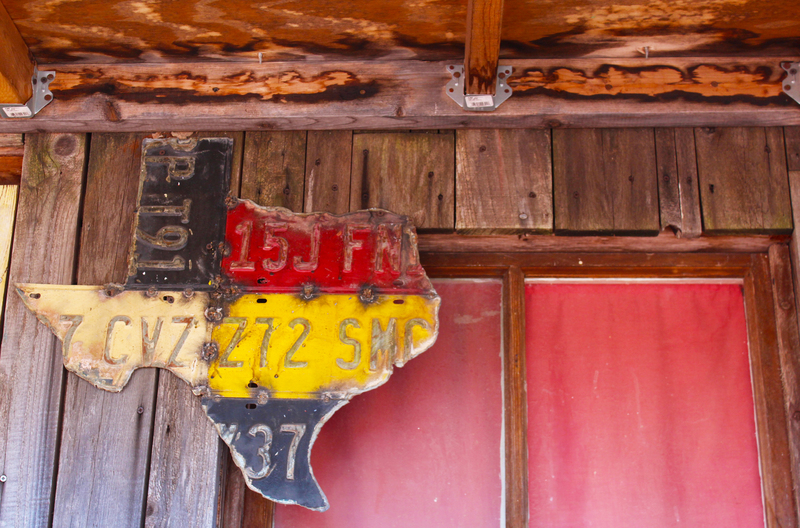 Hackemack also claims membership to a variety of German cultural groups, such as the Winedale German Singers, the Texas German Society and Hermann Sons, a fraternal insurance organization that was exclusively for the early German settlers in Texas but is now open to anyone who wants to join. 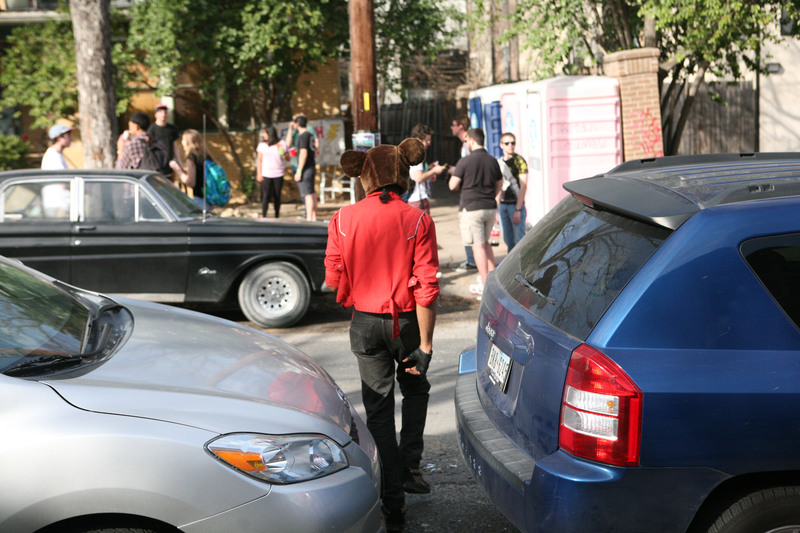 It is not uncommon to walk up to an Oktoberfest attendee and discover that he or she is heavily involved in a German band, organization or another Oktoberfest festival occurring in Texas. 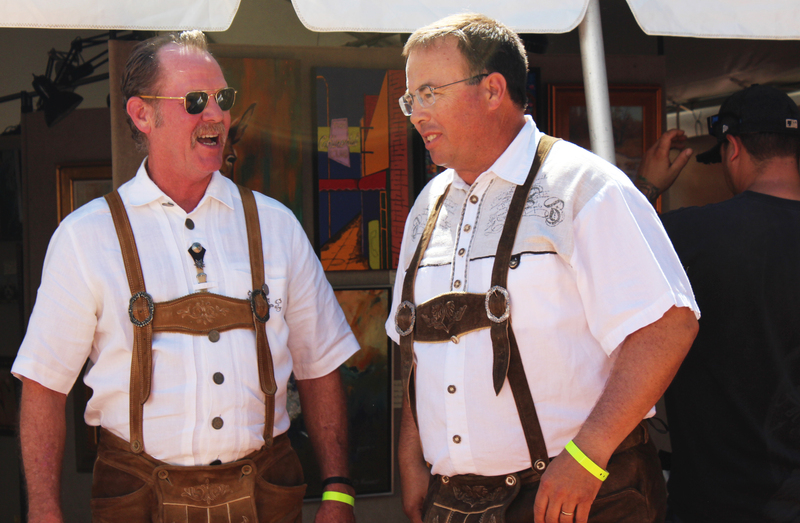 For example, several committee members involved with the planning of Wurstfest, a 10-day celebration of German culture in New Braunfels, Texas in November, frequent Oktoberfest in Fredericksburg in their outfits. 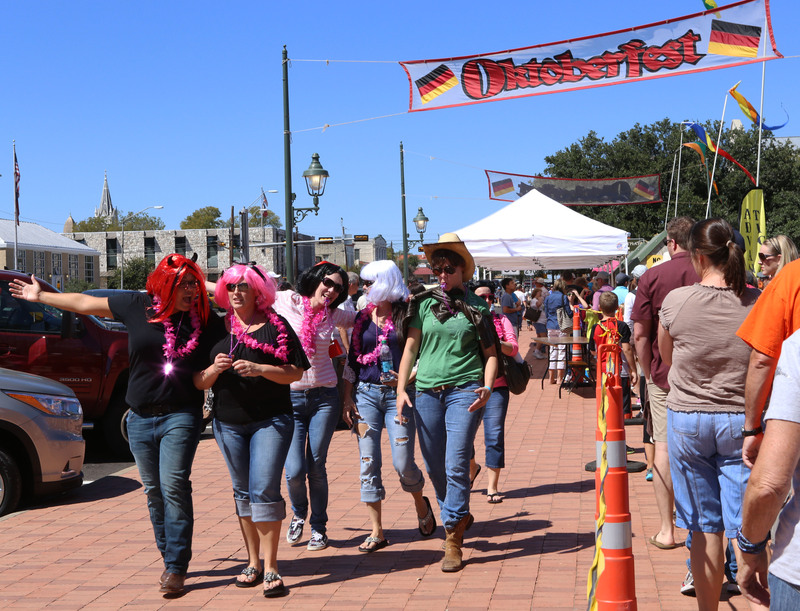 Each year, Oktoberfest in Fredericksburg brings together people from all over the state interested in a weekend of celebrating and indulging in German-Texan culture. 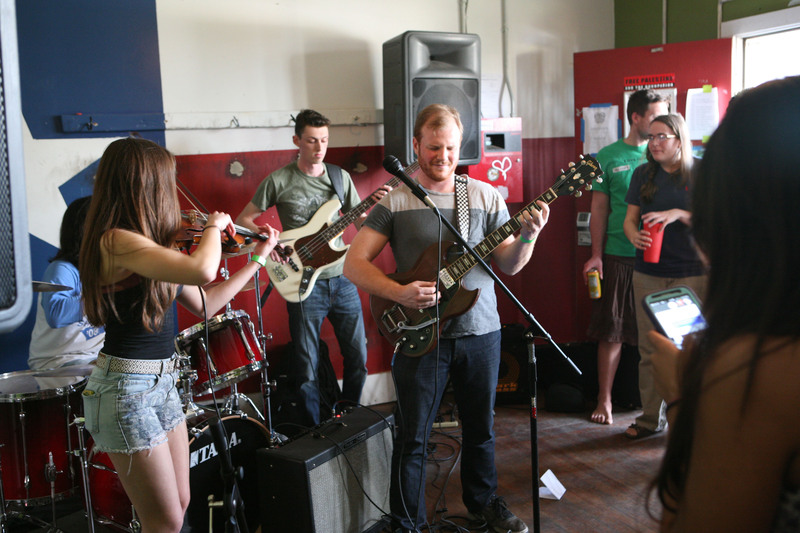 From veterans to first-time visitors, the festival draws in a diverse crowd. Photo by Larisa Manescu. This biergarten (beer garden) is the largest of the three pavilions in the Marketplatz (marketplace) where the Oktoberfest event is held. 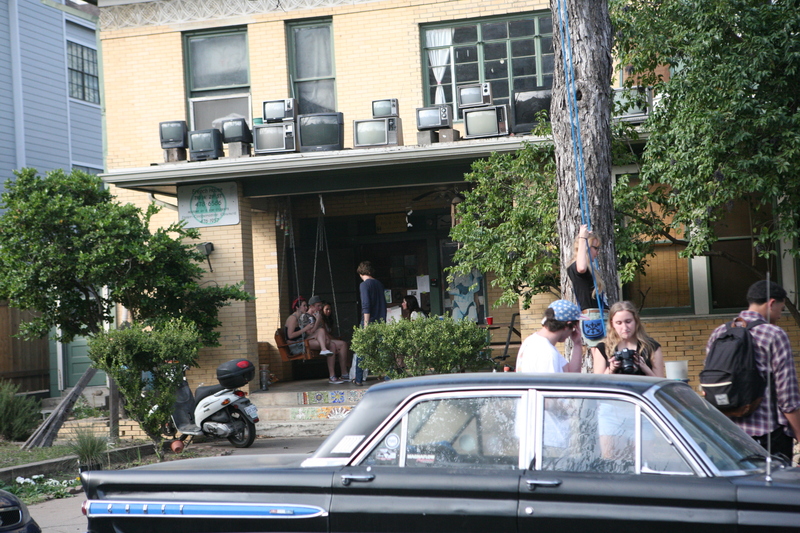 Seeking refuge from the blazing Texas sun, festival-goers convene to drink, socialize and dance. Photo by Larisa Manescu. Dancers participate in a western-style line dance, incorporating elements of Texan culture with traditional polka and waltz influences. Photo by Larisa Manescu. 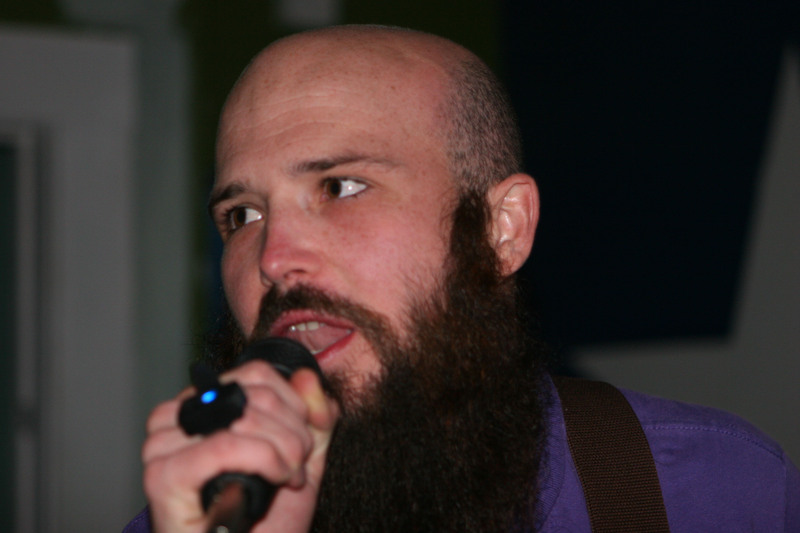 Milton Wagner plays lead guitar for The Red Ravens, a folk, polka and Czech band that was first founded in 1969. 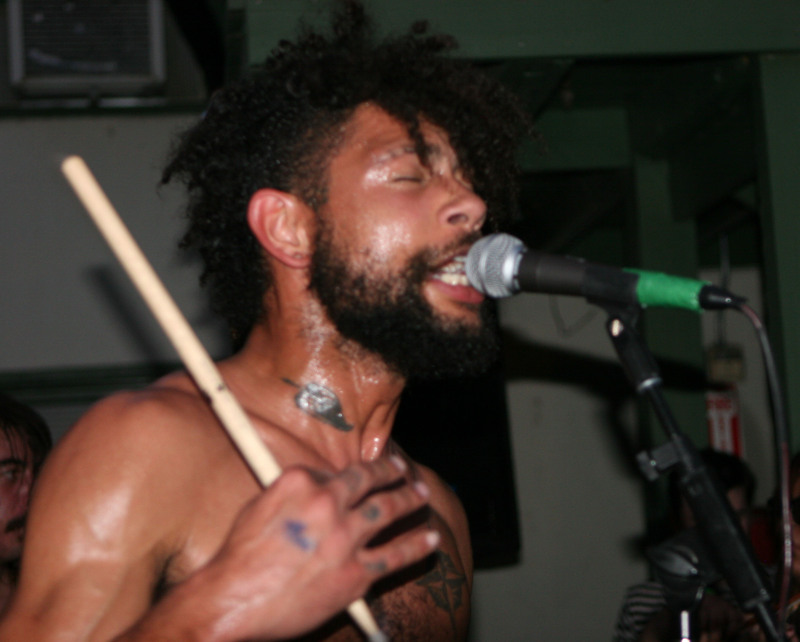 Although the current leader is the only remaining member of the original band, The Red Ravens are still actively book more than fifty gigs each year. Photo by Larisa Manescu. 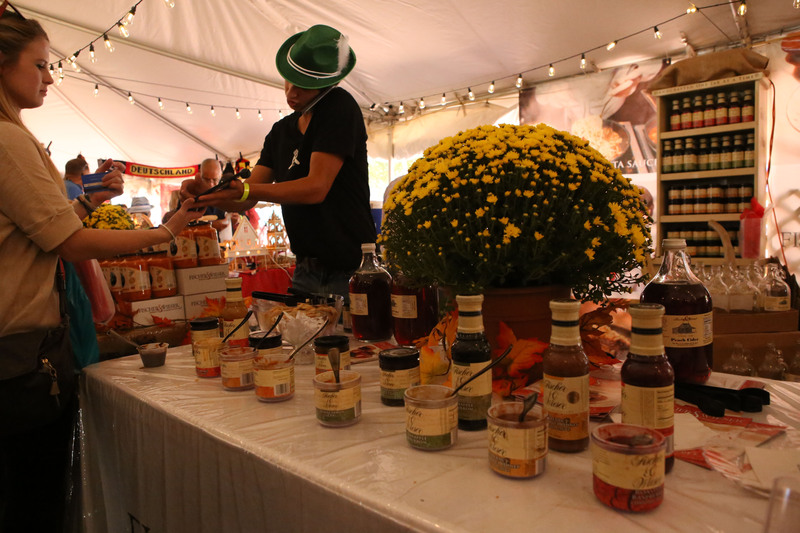 A booth offers free samples of Fischer and Wieser jellies, jams, salsas and peach cider. The local Fredericksburg company has its products available in stores around the United States. Photo by Larisa Manescu. A German beer stein carved into the Samuel Adams brand. While this stein is designed more for decorative than practical purposes, traditional steins are usually a liter. Photo by Larisa Manescu. Attendees take a break from the hustle and bustle of the festival to watch children play at the KinderPark, where a variety of children's carnival games are set up. Photo by Larisa Manescu. 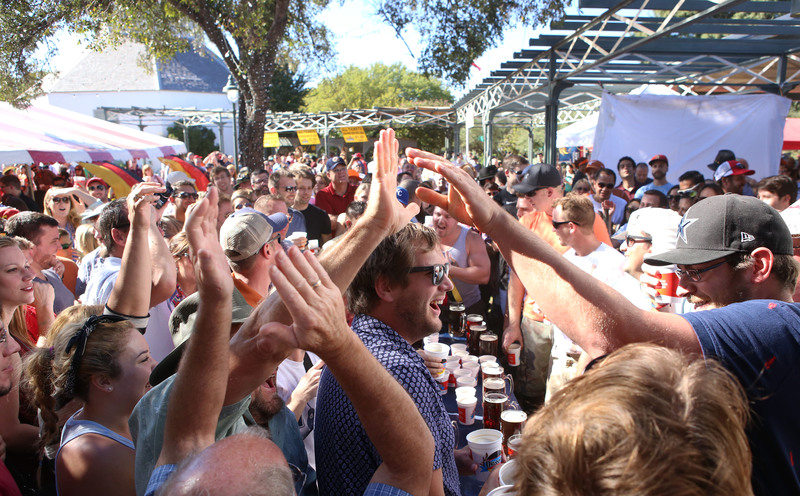 The uniqueness of Oktoberfest festivals in Texas is that they combine elements from both Texas and German culture. Photo by Breanna Luna. Two festival-goers dressed in leather lederhosen, common attire for men in both Germany and Oktoberfest festivals around the world. Photo by Breanna Luna. 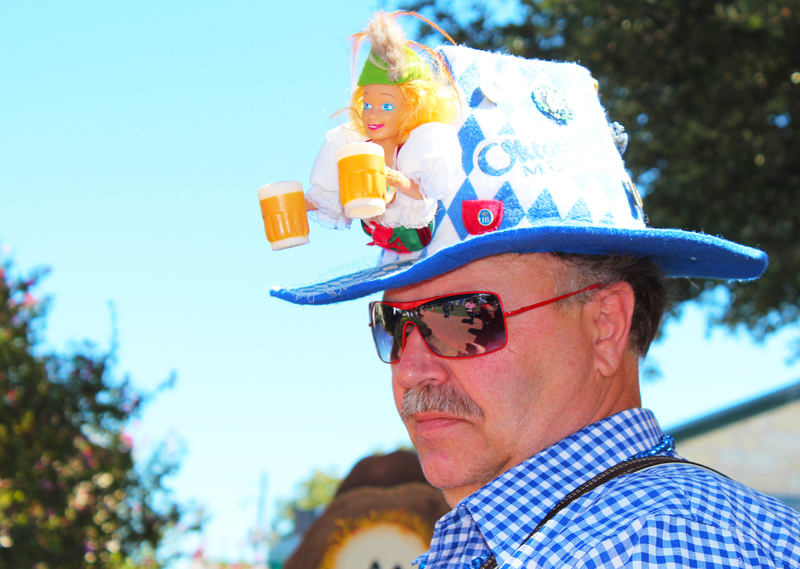 Oktoberfest brings out a variety of costumes ideas, like the extravagant hat sported by this festival-goer. Photo by Breanna Luna. 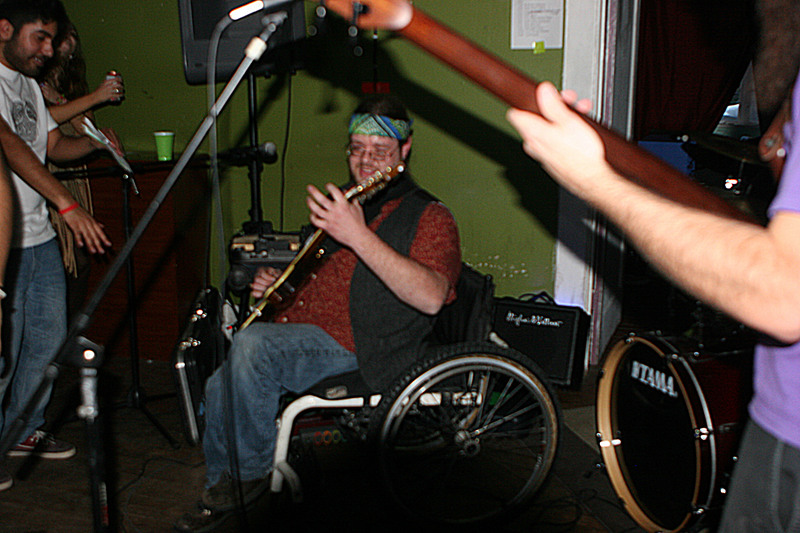 Grosse Opa Bill Holden takes some time off from his dancing to speak about his background in dancing, playing earlier in the day with his band and his involvement with Wurstfest. Photo by Breanna Luna. 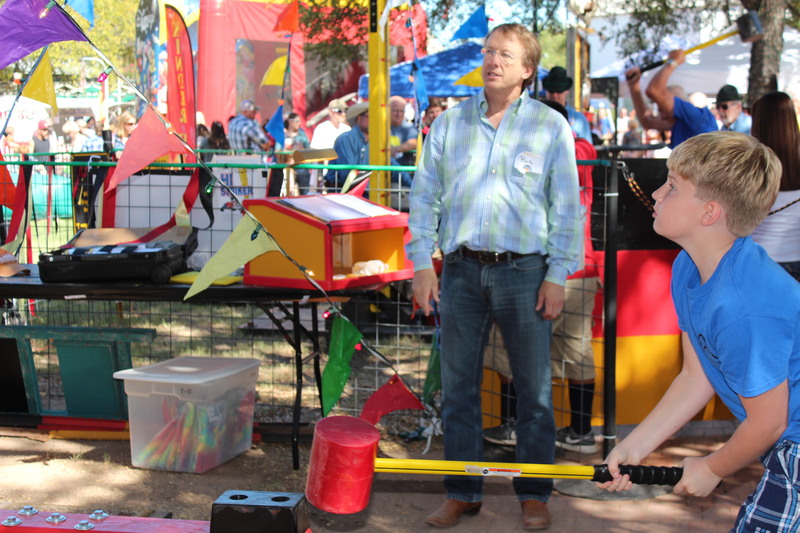 A child exerting effort at the high striker, a common festival game that offers three strikes to get the puck to hit the bell at the top. In the background, an adult tries his hand at the adult high striker. Photo by Breanna Luna. 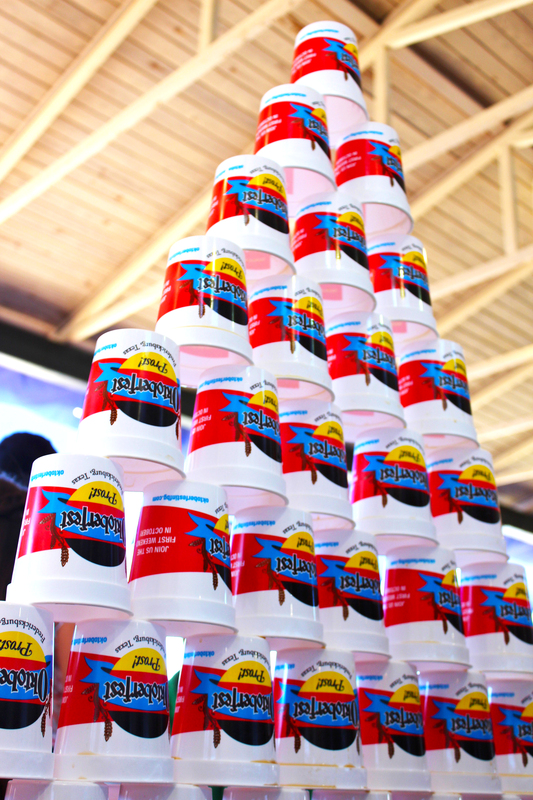 A pyramid of cups, a testament to the amount of beer flowing at Oktoberfest. 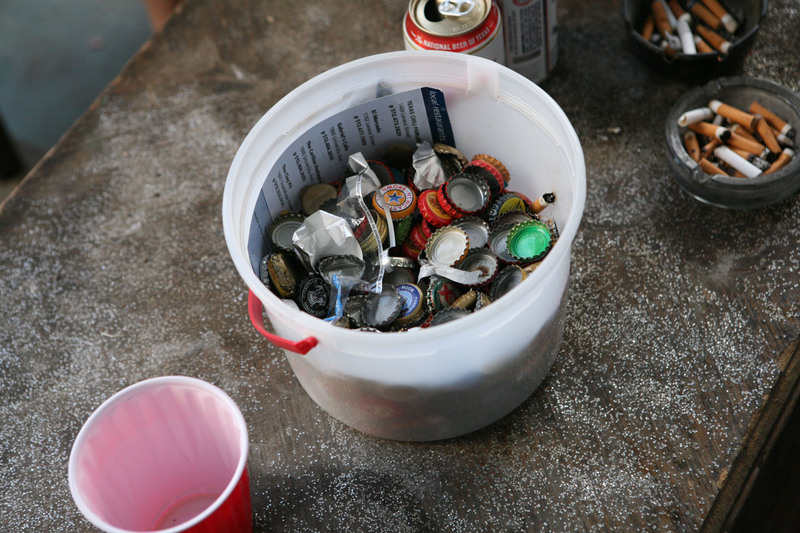 Walking around the festival, one can know how much beer each person has drank by how high of a cup stack they are carrying. Photo by Breanna Luna. 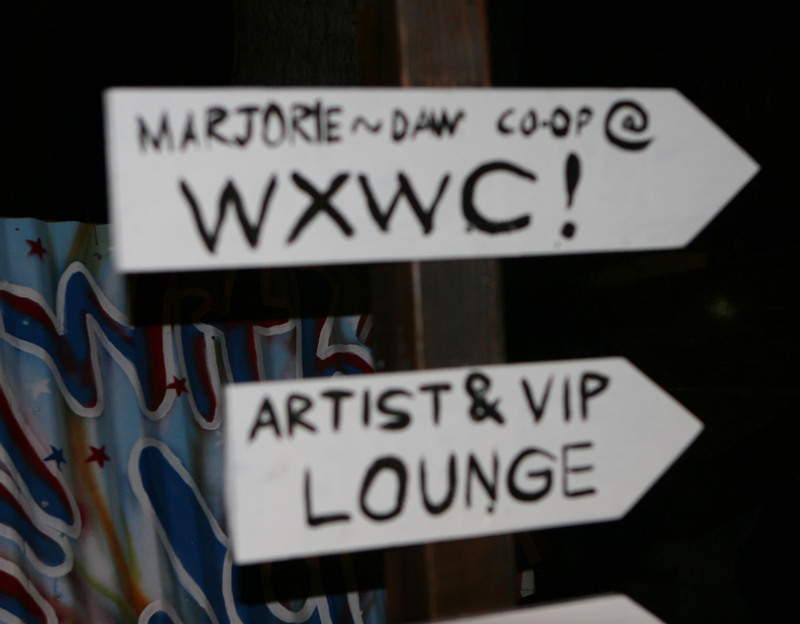 The planning that goes into the festival is extensive and the local community is heavily involved. Oktoberfest festival manager Debbie Farquhar and her group of chairs have meetings with all City departments, such as the police and fire department, who she said are always fully aware of the plans and eager to help. 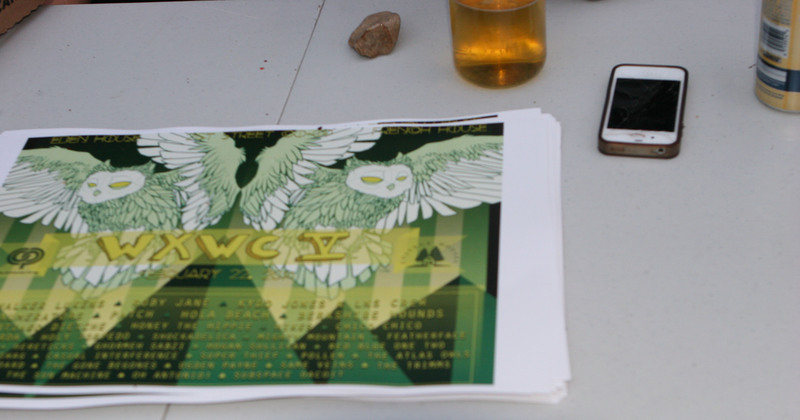 Although no official study has been done to quantify how much money the festival generates for the town, Farquhar said that the economic impact is evident. “Lodging was fully booked, retailers love it, restaurants had waiting lists, gas stations had their share and my list could go on,” Farquhar said. As soon as the festival is over, debriefings among the Oktoberfest Advisory committee occur and ideas for next year’s festival are already being generated. 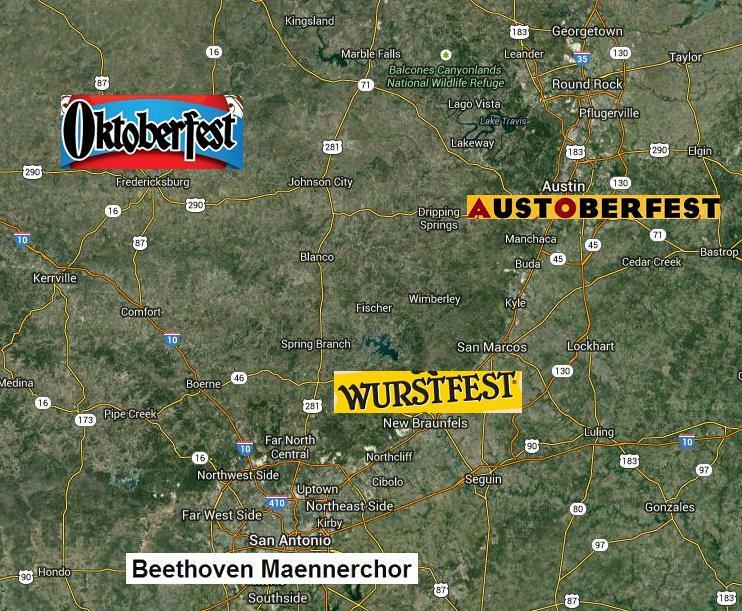 Oktoberfest Season in Texas from Breanna on Vimeo. 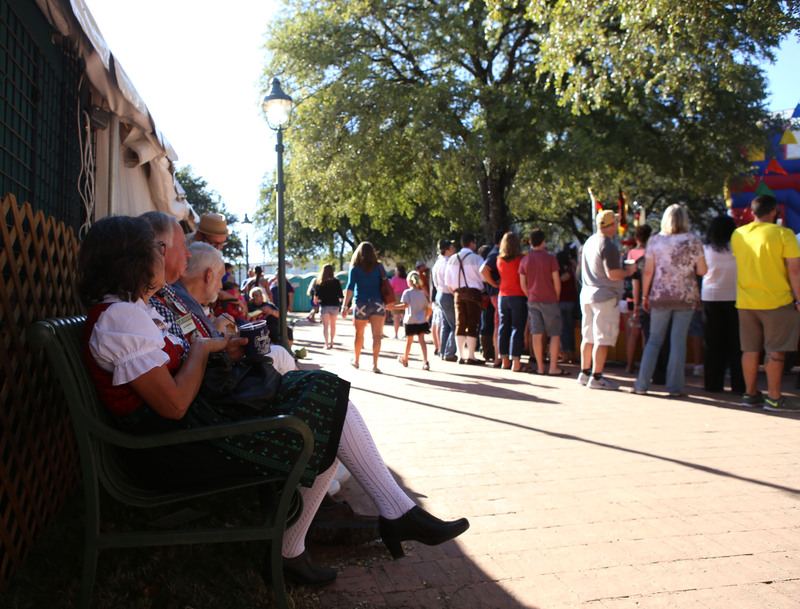 Other similar festivals have sprung up around Central Texas, with each looking to take advantage of the season and contribute to the maintaining of German culture in the region. 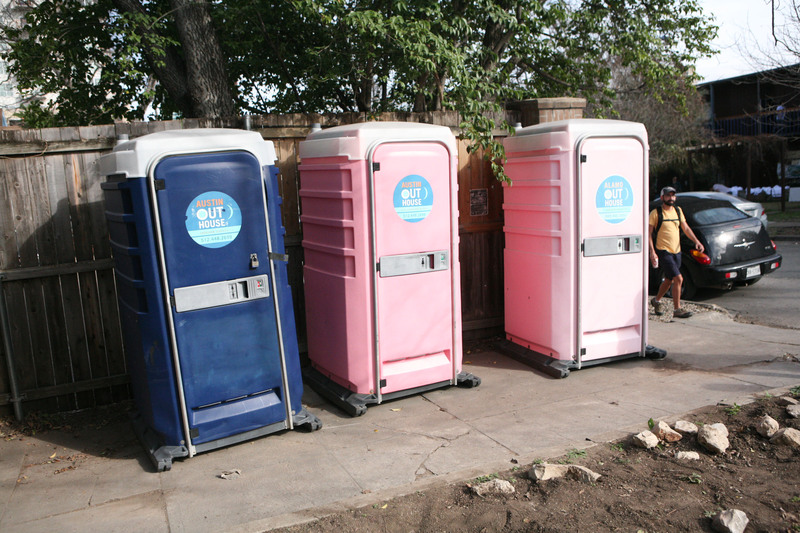 One such festival in Austin goes by the name of AustOberfest. 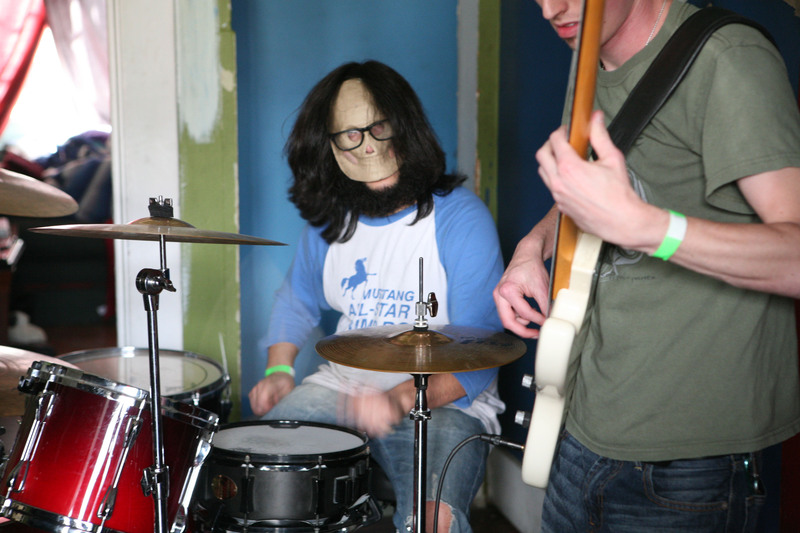 After a successful debut in 2013, the second annual event was held on Sep. 27 of this year. 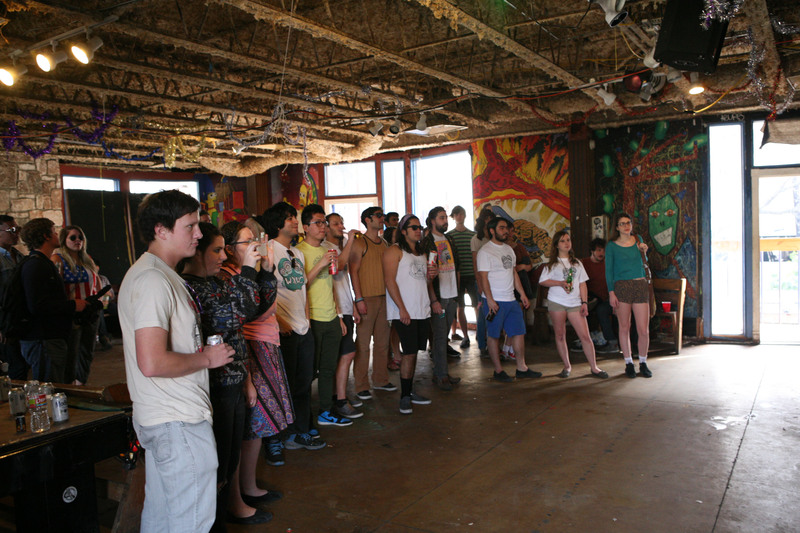 Austin Saengerrunde, a traditional German choral singing society and the oldest ethnic organization in Austin, hosts the newly established festival. Brian Michalk, the organization’s president, said that the event had more than doubled in size in terms of visitors since it was first held one year ago. 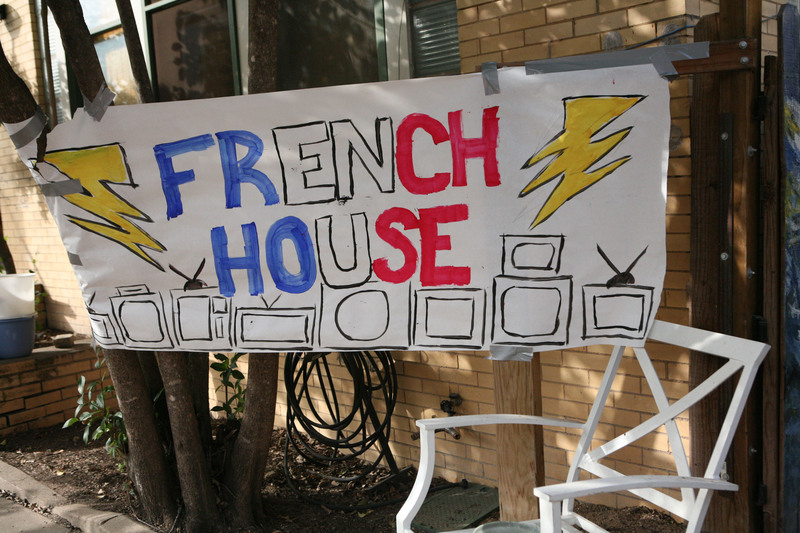 “We’re very happy with the growth,” Michalk said. 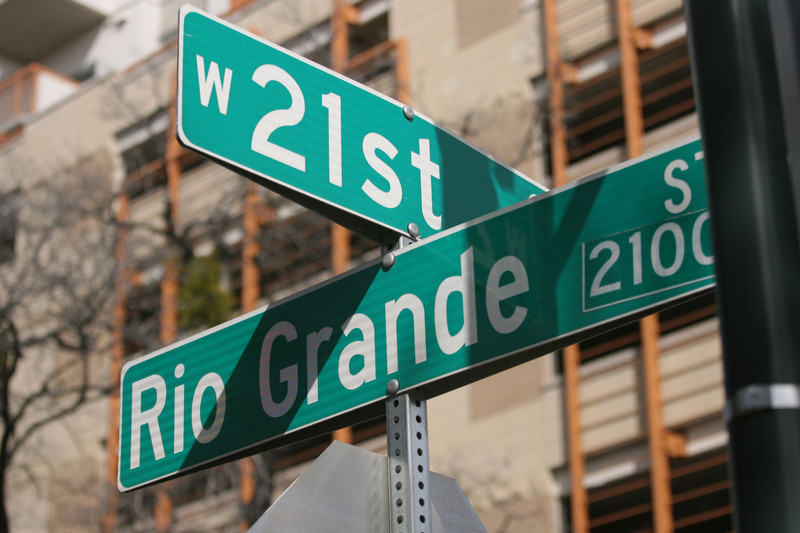 Preparations for a large festival in the heart of Austin require planning far in advance. AustOberfest staff begin work for the event six months in advance, making contact with potential sponsors and vendors and advising city officials of potential traffic disruptions. AustOberfest organizers would one day like to be able to close down additional streets around their location at 1607 San Jacinto Blvd. 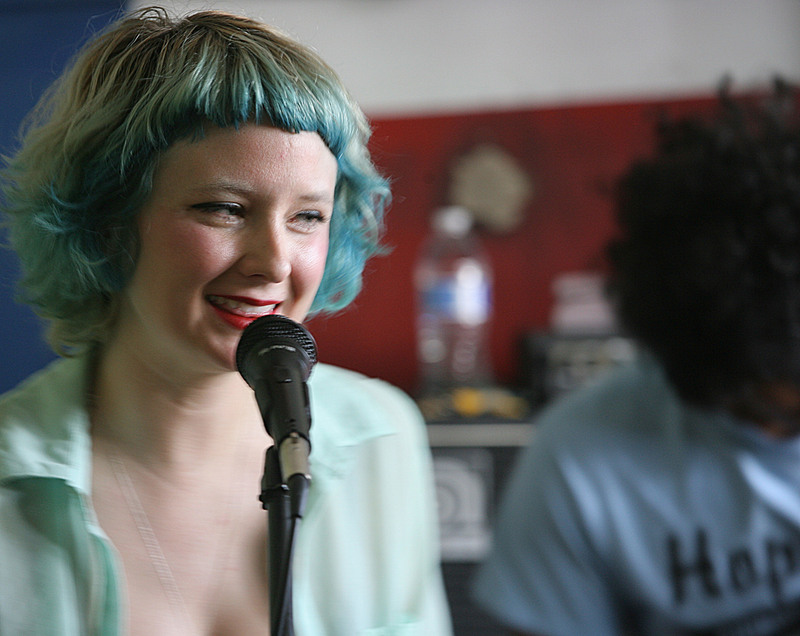 Miletus Callahan-Barile, Saengerrunde’s facilities director, emphasized the positive effect that such a festival can have on the regional vendors who participate. 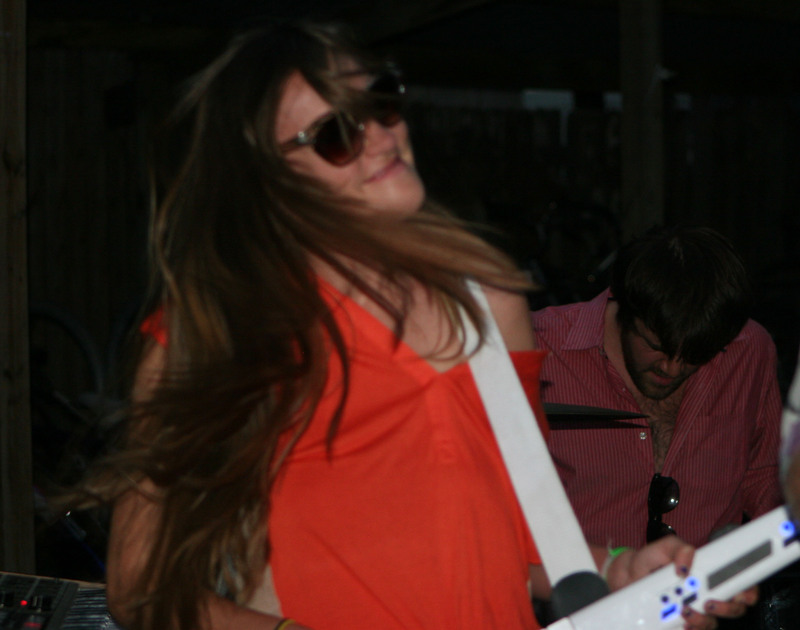 Even so, Callahan-Barile did acknowledge the importance of offering strong entertainment value to visitors at a festival. 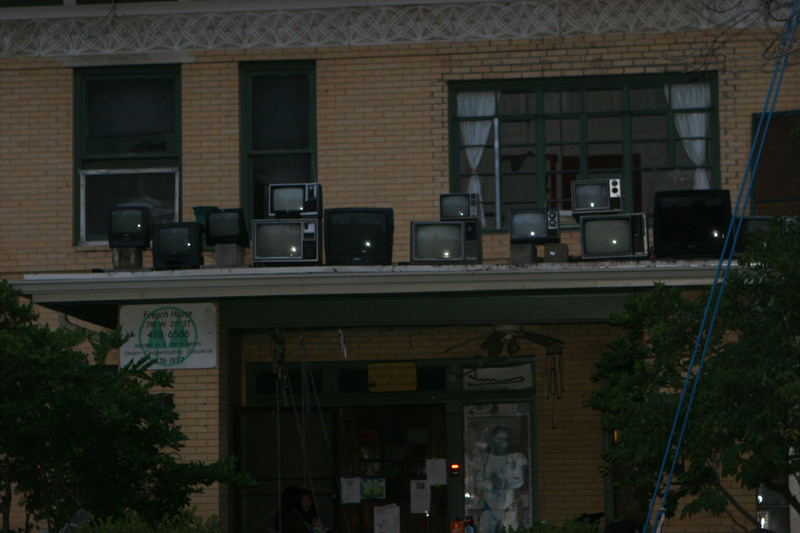 And Michalk was sure to point out that arranging all of the assorted entertainments on offer isn’t cheap. 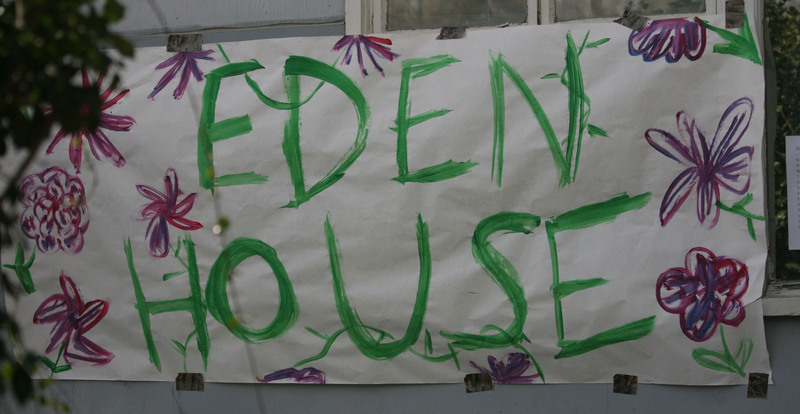 “Budgeting is always difficult for something like this,” Michalk said. 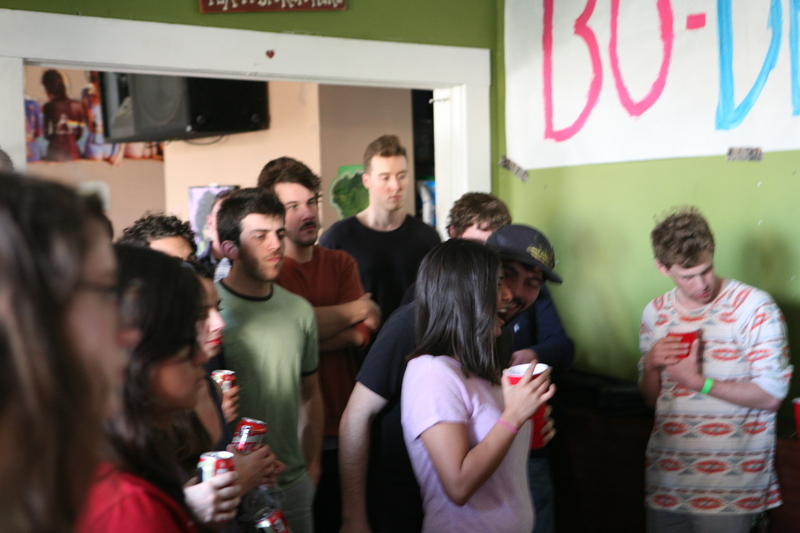 While the available budget does grow for a festival as the event becomes larger, the desire for bigger and better fare and fun isn’t easily sated. And so it is that AustOberfest organizers have already begun to consider how to go about funding a 2015 event that will outdo this year’s. 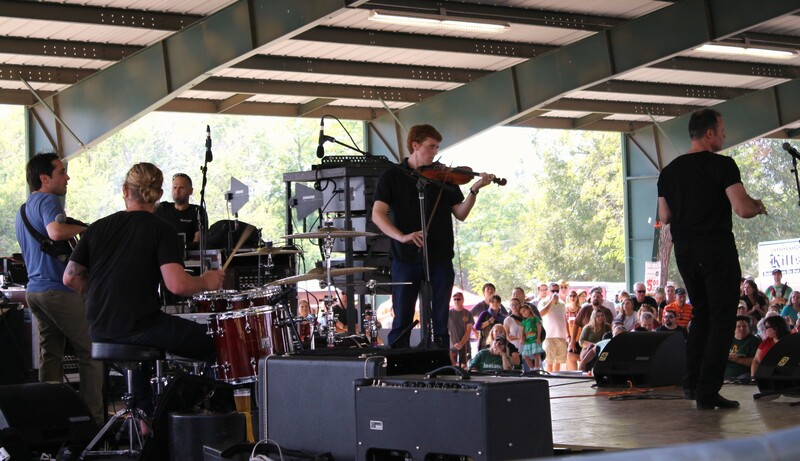 But for all of the planning that must go into these festivals and others like them in Central Texas, the mission remains the same: bringing German culture to local residents and showing them a good time. A few of the season’s main festivals in Central Texas.